Looking for a blender with dispenser spout? Here are 5 solid options that will let you dispense your blended creations without actually pouring them for an easy serving experience. Let's get to the blenders. This powerful blender from Hamilton Beach offers a revolutionary action and motion to ensure that all of your ingredients will be forced down to the blades, which means that you won’t have to use a tamper to push them down. This makes blending a lot faster and easier and ensures that when you dispense the drinks that you made, they will pour easily out of the dispenser and won’t cause a clog. Unlike other types of blenders that have dispensers, this blender has four different speeds that you can choose from, as well as pulse settings, which makes getting your drink as smooth as possible without problems an easy task. The patented blades are stainless steel and designed specifically to cut through ice and other frozen ingredients without any problems. This means that you can enjoy a frosty beverage without having to add whole cubes of ice at a later time. With two speeds, plus an optional pulse feature, you can easily blend your drinks to a fine consistency before using the dispenser to fill your glasses. 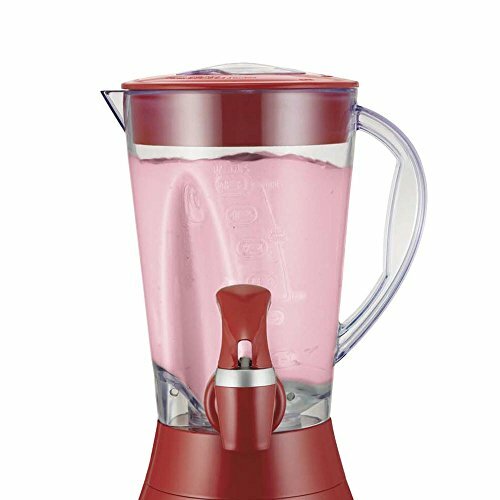 The 6-cup jar on this blender is large enough to handle a lot of drinks all at once very easily, which ensures that you and all of your friends or family members will have a drink when you are together. You can count on the stainless steel blades to be able to power through fresh or frozen fruit, as well as ice, so you don’t need to worry about chunky drinks or about your blender’s motor wearing out. If you do have problems with the blender not having enough power to easily puree or blend ingredients, then use the smoothie stick to tamp down ingredients and make sure that they reach the blades for fast and even blending. The dispenser is very easy to use and has a large paddle on top that makes it simple for even small children to serve themselves a smoothie or other blended drink. Clear measurements on the side of the glass jar means that you can easily measure ingredients while you are adding them to the blender, which will reduce the amount of time that you spend preparing your drinks. While this blender is a great option for smoothies and other drinks, it can easily be used to make salsa, sauces, and even cream. This makes it a workhorse in the kitchen and a great choice for anyone who wants a multi-use blender. 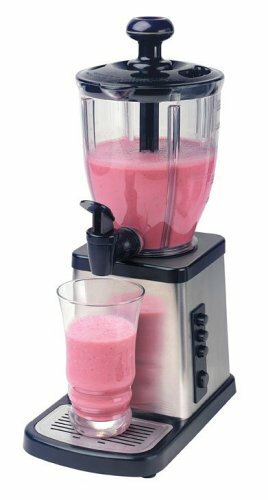 The rotary switch makes this blender very easy to operate, and you can quickly select from high and low speeds to ensure that you blend your ingredients to the right consistency. Thanks to the pulse feature, it’s easy to make sure that your ingredients are chopped up, or you can layer your ingredients to have chunky soups or salsas. The ice crushing function on this blender allows you to easily create frosty drinks without having to worry about whether or not you are going to accidentally damage the blades on the blender. Unlike other blenders that have plastic jars, the glass jar on this blender is designed to last and will stand up to a lot of use without being damaged. Rather than trying to take the whole blender apart when you are finished using it, you can instead run the auto clean. This will prevent you from having to try to take it apart and then put it back together whenever you use it to make a beverage. It’s easy to run hot water through the dispenser to remove any leftover beverage so that it will not harden in the dispenser and cause problems in the future. 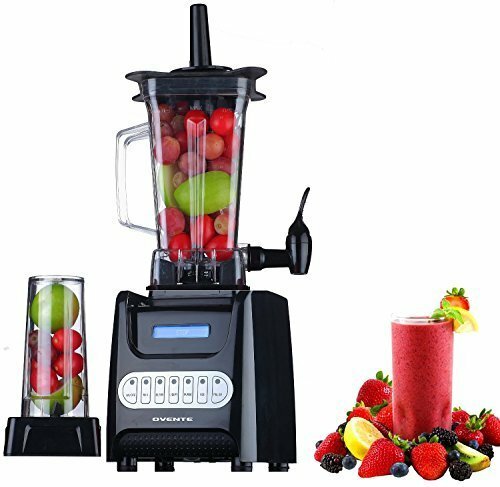 This is an incredibly powerful and durable blender that will be able to easily and quickly chop, puree, liquefy, and grind most any ingredients that you put in it, thanks to the 1000 Watt motor and powerful blades. 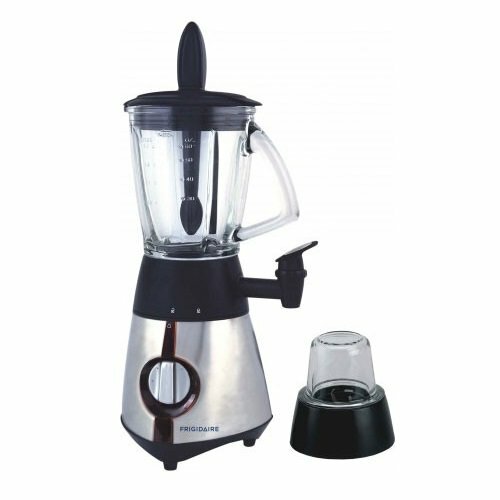 Unlike other blenders with dispensers, this blender features a very durable motor and is designed to take the place of a number of different appliances. Not only can it blend very easily, but you don’t ever have to worry about peeling any fruits or vegetables that you put in the blender, as it can power through most any hard or fibrous food. With 6 different speeds to choose from, you will be able to make any blended drink that you want and dispense it quickly and easily. Thanks to the strength of the motor, you can easily chop and puree most anything. Additionally, this blender comes with a travel mug that will allow you to make a drink and take it with you on the road. This decreases the amount of washing that you will have to do when you are done making smoothies. The large 7-cup jar makes it easy to make a lot of smoothies all at once, so you don’t have to blend drinks in batches when you are entertaining. The smoothie stick that fits neatly through the lid of this blender makes it easy to ensure that all of your ingredients are evenly blended and that they don’t get stuck above the vortex. Unlike other types of blenders with dispensers, this one has a drip tray, so you don’t have to worry about any drips of your smoothie getting on the counter or on your table, which can be sticky and attract ants. You can choose from low and high speeds, and you can use the pulse feature to make sure that your final product is nice and smooth. While this blender is tall enough that there is plenty of space for blending large amounts all at once, it is still small enough that it doesn’t take up a lot of room on your counter-top or need special storage in your kitchen. It’s backed by a 1-year warranty, which will usually provide you with enough time to determine whether or not there is a problem with your blender and to contact the company for repair or replacement. The dispenser handle is very easy to operate and is designed to prevent the blender from dripping when closed. This sleek design looks great in any kitchen.